The Diamond Among The Pearls! Unit 1604 Pearl is offered by Simply The Best! and it is just that....Simply the Best that the Pearl has to offer. It is a luxurious 2 bedroom, 2 bath condo that is set apart from the rest! We are nestled on the 16th floor which offers a magnificent view of the Gulf and the pristine white sand of Navarre Beach. When you really want to get away from it all – this is the place! Navarre Beach is one of Florida’s hidden treasures and so is this unit. Navarre is a quiet, family oriented beach – enjoy the natural beauty of the gulf without the crowds to spoil it. You have a spectacular view of the Gulf and we sit right on it! The Santa Rosa Sound has lots of activities to enjoy - wave runner rentals, fishing, sailboats, etc. The Sound view on the North side of the complex is beautiful! Enjoy easy living with fresh gulf breezes and expansive views of the gulf from the 16th floor. 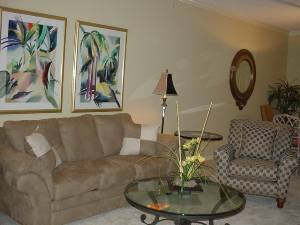 The décor is tropical and upscale, with perfection and beauty found throughout the condo. When only the best will do this is the unit for you. High Def, Flat Screen TV's throughout! There has been great attention give to details – in every area – kitchen, baths, bedrooms, and living space. There are ample linens available and the kitchen is fully equipped. All of the comforts of home are at your fingertips. This is not the typical rental unit – it is our second home and we invite you to come for a visit. 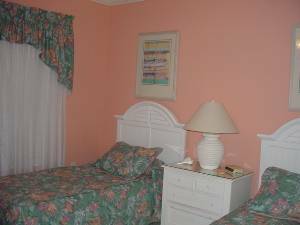 The décor is upscale with beautiful artwork and furnishings. 1604 has a spectacular dining area with a one-of-a-kind dining table made from olive wood. There is nothing ordinary about this condo – from its furnishings to its view – it is Simply The Best that the Pearl has to offer – The Diamond Among The Pearls! The master suite has a king sized bed and it opens onto our balcony. The view is spectacular from both the bedroom and the living area. The turquoise water is post card perfect and the pristine white sand is the perfect backdrop for our exquisite complex. Watching a sunset from the balcony is something you’ll never forget. The master suite is the perfect place to relax. You’ll enjoy everything about it from the double vanities, walk in closet and dressing area, shower and whirlpool tub for two. 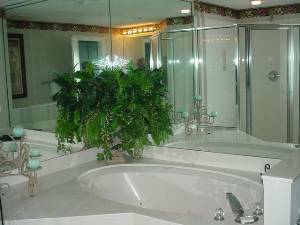 The second bedroom and bath are charming and “beachy”. There are two double beds in the second bedroom and a comfortable queen sleeper sofa in the living area. The living area has a mirrored wet bar and is spacious and inviting. Every room has a TV and DVD for your enjoyment. The nine foot ceilings and the full wall of windows offers a view of the gulf that is nothing less than spectacular. The Pearl is a prestigious complex on Navarre Beach. 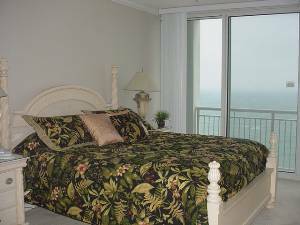 It has two beachside pools (one heated), a hot tub, and an exercise room over looking the beach for your enjoyment. This is truly a special condo in a truly special complex on a truly special beach. Come join us! Two wonderful outdoor pools (one heated) and a hot tub. Great exercise room overlooking the beach. Beach Chair and Umbrella Rental service available right in front of the complex . Weeks run Sat - Sat. 3 night minimum stay required. Must be 25 years of age. No Pets and No Smoking. We require half of the total payment within 7 days of reservation and the balance within 3 weeks of check in date. $250.00 damage deposit required. You may pay by check or credit card (through Pay Pal). Deposit: $250.00 refundable damage deposit $1/2 of total required when booking, balance is due 21 days before check in. Cancellations and Refunds: Full refund if cancellation notice received 21 days before check in date. Business Name: Simply The Best!